The site for The Belfuse is once again active after breaking ground in January 2007 and sitting idle for more than 18 months. 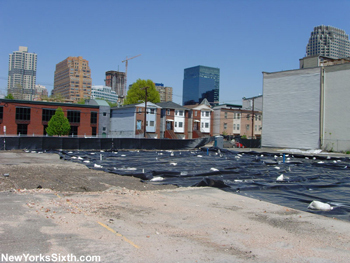 The ground was covered with black plastic, venting, and piping, leading to speculation there was some form of remediation required before construction could continue. The site was once home to the Bel Fuse company headquarters that relocated across the street two years ago. The Belfuse, or 198 Van Vorst Street, is a Fields Development Group project with 52 units. The building is architecturally similar to many low rise projects in Hoboken and the Paulus Hook neighborhood that mimic historic styles with a more modern twist.